A multiple All Ireland winner in his youth, Conal’s debut recording ‘The Top of Coom’ in 1990 is still regarded as a seminal recording of flute‐playing. Conal takes the basic elements of traditional music and forges them into a personal style which, once heard is unforgettable. His fast, rhythmically precise flute‐playing has an earthy raucous tone reminiscent of the saxophone and is driven by a spirit from the true heart of traditional music. Conal has played, toured and recorded with many of the music’s leading exponents and it is with great excitement that the world of Irish traditional music greets the news that his long overdue second recording, Cnoc Buí, is now on release. 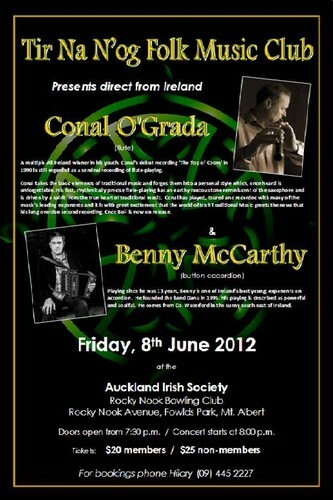 Playing since he was 13 years old, Benny is one of Ireland’s best young exponents on accordion. He founded the band Danu in 1995. His playing is described as powerful and soulful. He comes from Co. Waterford in the sunny south east of Ireland.